Luxury Gift Boxes by Pantherella. Deep-lidded, Velvet-lined boxes provide the perfect accompaniment to Pantherella's finest English socks. Choose from our curated Gift Boxes where our designers have selected collections of socks that will make an ideal gift; or go for one of our 'Choose Your Colours' Gift Boxes where you can choose the colour of each pair of socks. A beautiful gift for someone who appreciates the finer things in life. 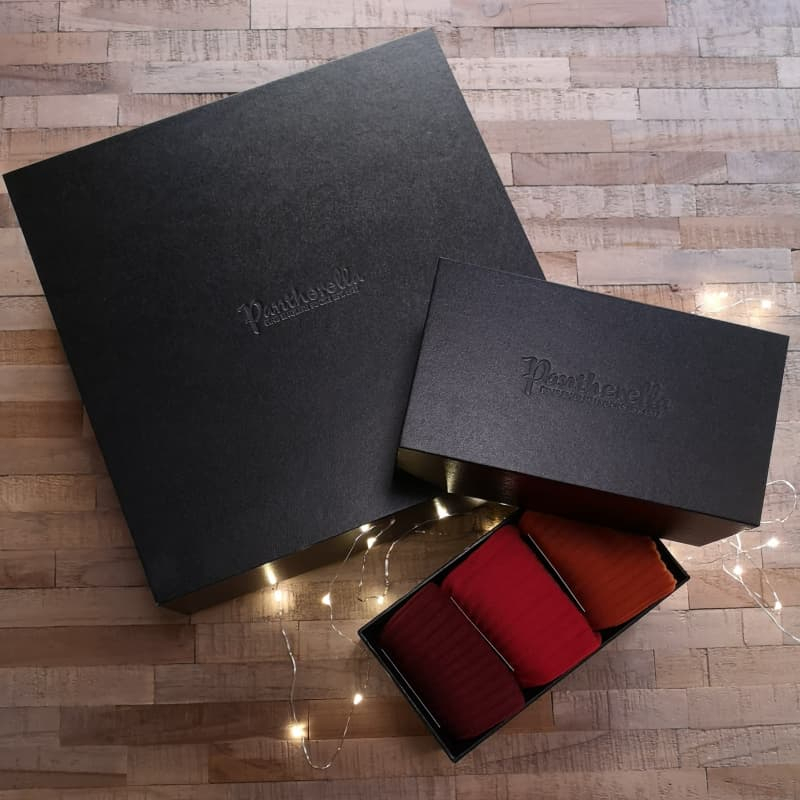 Pantherella have dedicated over 80 years to crafting the world’s finest socks and continues to excite with a collection of luxury sock gift boxes. Our beautifully presented gift boxes are velvet lined with a hand-picked selection of our most loved socks. If you are looking for gift inspiration our sock gift sets are the perfect Christmas or birthday present for those who appreciate luxury, heritage, and quality. Our socks are proudly made in England, hand crafted from the world’s most luxurious fibres. The collection is quintessentially British with a modern twist. Choose from our hand-picked collections, or you have the luxury to build your own collection from a generous array of shades and patterns and yarns. From the finest Fil d'Ecosse Egyptian cotton, the ultimate in superfine merino wool, to Cashmere the epitome of opulence, our collection is the perfect complement for a modern gent’s wardrobe. World renowned craftsmanship and never compromising on the finest details, Pantherella have been championing quality since 1937. Each pair hand finished with a seamless toe - this intricate process results in a virtually undetectable extremely comfortable flat toe-seam. Extended reinforced toe and heel. The most refined socks in the world. The perfect Christmas or birthday gift. Crafted from the world’s finest Cashmere, unrivalled in softness and warmth. Pantherella Cashmere socks are epitome of opulence and beautiful designs are guaranteed to brighten up long winter nights. Subtle colourful hews ensure toasty toes all season long. The ultimate luxury for your feet. Pantherella use the finest Italian sourced, extra-long staple Egyptian grown cotton. This results in wonderfully soft and durable socks, that are shrink and pill resistant, and absorbs dye brilliantly while maintaining its silky lustre. Pantherella uses the ultimate in superfine merino wool. When spun into socks it provides warmth without over heating the wearer and draws moisture away from the skin for all year-round comfort. Our superfine merino wool is worsted spun which ensures strength and the long fibres help to give our socks their characteristic supremely soft feel.